The only synopsis I find anywhere is this: "With her trademark lyricism, Maggie Stiefvater turns to a new world, where a pair are swept up in a daring, dangerous race across a cliff--with more than just their lives at stake should they lose." That's all you need to know. That's what the book is about. It's about a horse race...a WATER horse race. It's dark, it's tense, it's violent, it's utterly unique and it's AWESOME! I wasn't a huge fan of Maggie Stiefvater after the Shiver/Linger Werewolves books. I really didn't like them much at all. She's completely redeemed herself in my eyes with this book. It might be the best book I've read so far this year. It's definitely right up there in the top 3 for sure. 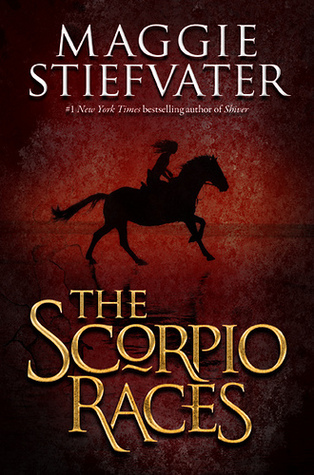 The story is about these violent man-eating water horses that come out of the ocean and the riders capture the horses and train them to be raced in November when the Scorpio Races are held. Sean Kendrick is the best trainer and rider on the island. He's won 4 of the last 6 years. He's signed up to race on his favorite water horse Corr. Kate "Puck" Connelly is a young woman who has signed up to race to save her home. Problem is, no woman has ever raced before, but there's no rule against it. She's also riding on her "regular" horse Dove, which is also not against the rules. There's a lot of opposition to her presence in the traditionally all-male all-water horse race. I won't tell you anymore because I know you'll be dying to read it! Run out and get yourself a copy when it comes out. Pre-order one right now! I LOVE the sounds of this book. I also didn't like Maggie Siefvater's Shiver series but I did enjoy Lament and Ballad. Happy to hear it as amazing as it sounds! I'm pre-ordering myself a copy.